Date Added: Sunday 10 June, 2018 by Felix W.
This beautiful,detailed handdrawn map realy exceeds all the other commercial maps you might find elsewhere.! 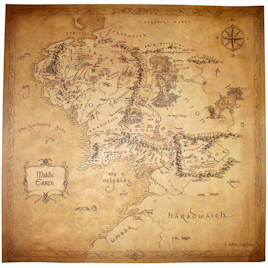 I bought in on canvas and after putting in it on a wedge framework and framing it in an old wooden frame it looks as if it originated right from middleearth. Just one quick note on the shop itself: Very quick and uncomplicated delivery from New Zealand to Germany and great customer service!.. Date Added: Saturday 20 April, 2013 by Glen D.